How much money do I have? Can I afford to buy houses or hotels? I started running out of money pretty quickly. My dad managed to buy up most of the board so every time I passed go and collected $200 I had to shell it over to him. The more money I lost the more frustrated I became. I wondered, who ever thought that this was a fun game? 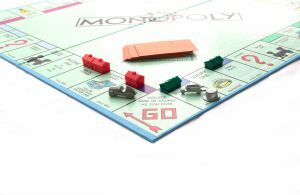 So I did some research and was shocked to learn that Monopoly is actually the most popular board game in history and it made it to The National Toy Hall of Fame in 1998. I also learned that the original concept of the game was to point out unequal wealth in society. Now it all makes sense! Monopoly does a great job of making that point. The reason I wasn’t enjoying the game was because I kept growing poor while my dad was getting rich. Since discovering the true point of the game my feelings have drastically changed. It is a great game that can be used as a tool to teach kids and adults how to manage their money and stay afloat amongst inequality. And to make the game even more fun, you can buy a version that represents the city that you live in!